Lyft plans to make its public market debut in the coming week. The car sharing company’s I.P.O. will be the first of many highly valued tech companies that are expected to hit American stock exchanges this year. Uber, Slack, Postmates and Pinterest have all filed documents with the S.E.C. to list shares. Palantir, Peloton and possibly Airbnb are expected to follow later this year. • Venture capital cash allowed America’s current wave of unicorns to eschew the public markets — and the spotlight that comes with them. • That means a large portion of investors have been unable to buy a slice of the fastest-growing start-ups. With Lyft’s I.P.O., that’s about to change, which explains much of the excitement it is generating. Here’s your cheat sheet for the offering. Founded by Logan Green and John Zimmer in 2007, Lyft was initially called Zimride and focused on pooling riders for long-distance trips. In 2012, Mr. Green and Mr. Zimmer renamed the company Lyft and shifted the business toward providing short trips, mimicking taxi rides. • Lyft gave 18.6 million people at least one ride in the last quarter of 2018, up from 6.6 million in late 2016. • Lyft only operates in the U.S. and Canada, unlike Uber, which has operations across the globe. • But it has matched its rival’s innovation, by developing self-driving car technology and expanding into short-term bike and scooter rentals. The company expects to be valued at as much as $23 billion. It plans to sell about 35.4 million shares, including the additional shares allotted to the underwriters, at between $62 to $68 a piece. At the high-end of that range, it will raise $2.4 billion. That’s well above the $15.1 billion that private investors valued it at during a financing round in June. And it would make it one of the largest I.P.O.s in the past 10 years. 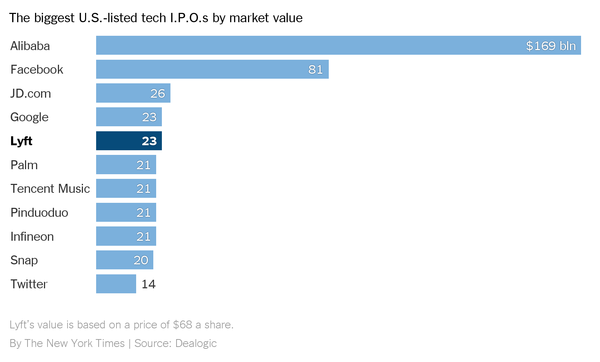 At a $23 billion valuation, Lyft’s offering would rank as the fifth largest since the financial crisis, and among the largest ever for American technology start-ups — only Facebook’s I.P.O. in 2012 would be larger. JPMorgan Chase, Credit Suisse and Jefferies are the lead underwriters of the I.P.O. for Lyft. Goldman Sachs and Morgan Stanley, the top underwriters of tech I.P.O.s recently, are both working on Uber’s offering. In all, Lyft will have 29 underwriters for its I.P.O., 13 (or 45 percent) of which are firms owned or led by women, minorities and military veterans. By comparison, such firms accounted for 30 percent of the underwriters Facebook selected for its I.P.O. and 14 percent for Snap’s. After going public, the company will have two classes of stock: class A shares, which carry one vote each, and class B shares, which carry 20 votes. Lyft plans to sell only class A shares in the offering. Lyft’s two founders will hold the Class B shares. That means that Mr. Green, the C.E.O., and Mr. Zimmer, the president, will own roughly 5 percent of the company’s outstanding stock but control nearly 49 percent of its voting shares. This is quite normal in Silicon Valley. Facebook and Google went public with a dual-class structure that gave outside shareholders one vote per share and insiders 10 votes per share. Snap went further: It issued only nonvoting shares during its 2017 I.P.O. Companies with dual-class stock structures outperformed those with a single stock structure in recent years, according to some studies. But prior to 2010, studies show, such companies didn’t perform as well. Lyft is growing quickly. Its revenue more than doubled to $2.16 billion last year from 2017. Its losses are also increasing, though not nearly as quickly. The company reported a loss of $911 million last year, up from $688 million in 2017. Total costs and expenses were $3.1 billion in 2018, up 77 percent from $1.8 billion in 2017. Uber’s losses are smaller in percentage terms. Lyft’s rival, which has disclosed its finances for several years even though it is not public, said in February that it lost $1.8 billion in 2018 on net revenue of $11.3 billion. The risk factor section of any I.P.O. prospectus acts as a warning label for investors. Lyft’s is no different, but it offers a discussion of regulatory and data security issues that could become a recurring theme in this year’s I.P.O.s. Rivals: The company faces a long list of competitors on several fronts. Uber, Gett (along with its acquisition Juno) and Via are its main ride-sharing rivals, along with regular taxi companies and automotive manufacturers, such as BMW, that are looking to enter the sector. Its bike and scooter sharing business faces competition from Lime, Bird and Uber’s acquisition Jump. And Waymo, Apple, Baidu, Uber and a number of other tech and auto companies compete with it on autonomous vehicles. Labor: Lyft’s million-plus drivers are independent contractors, not employees. Legal actions that classify them as employees “could have an adverse effect on our business, financial condition and results of operations,” the company says. Autonomous driving: Among the biggest risks involved in the push to driverless cars is getting beaten in the race. The first companies to offer autonomous ride sharing “are expected to have long-term advantages compared with traditional non-autonomous ride sharing offerings,” Lyft says. For Lyft’s current shareholders and employees, the I.P.O. could provide a windfall. Here’s a rundown of who stands to gain. • Mr. Green and Mr. Zimmer will hold stakes in the company that are set to be worth $570 million and $390 million, respectively. • The Japanese e-commerce giant Rakuten is Lyft’s biggest shareholder, with a 13 percent stake. At $68 a share, its holdings would be valued at $2.1 billion. It will own 11.6 percent of Lyft’s stock after the I.P.O. • General Motors invested $500 million in Lyft in 2016. That stake could be worth as much as $1.27 billion at the time of the I.P.O. • The fund giant Fidelity is Lyft’s third largest shareholder. Its stake could be worth as much as $1.26 billion. • Alphabet owns 12,828,964 shares, most of them purchased by its venture capital arm, CapitalG. That stake is worth $870 million at the high end of the range. • The venture capital firm Andreessen Horowitz was among the earliest investors in Lyft. At $68 a share, the firm’s stake will be valued at just over $1 billion. Governments and money managers have made a push to improve gender diversity on corporate boards. Last fall, California, where Lyft is headquartered, became the first state to require its publicly held corporations to include women on their boards. • Valerie Jarrett. The former senior adviser to President Barack Obama has been on Lyft’s board since July 2017. • Maggie Wilderotter. The former chief executive of the telecom company Frontier Communications joined Lyft’s board in May 2018. • Ann Miura-Ko. The co-founder of Floodgate Fund, a venture capital firm, has served on the board since June 2016. Rounding out the board of directors are: its chairman, Sean Aggarwal, of Soar Capital; Ben Horowitz of Andreessen Horowitz; David Lawee of CapitalG; and Hiroshi Mikitani of Rakuten. “The last time a fast-growing, lossmaking tech company tried this hard to persuade Wall Street to judge it by its own measure of profits, things didn’t end well,” the FT’s Richard Waters writes. He is referring to Groupon. You can find live updates throughout the week at nytimes.com/dealbook.